Flutisal 100 ConviCap: Each capsule contains Fluticasone Propionate BP 100 µg and Salmeterol Xinafoate BP equivalent to 50 µg Salmeterol inhalation powder. 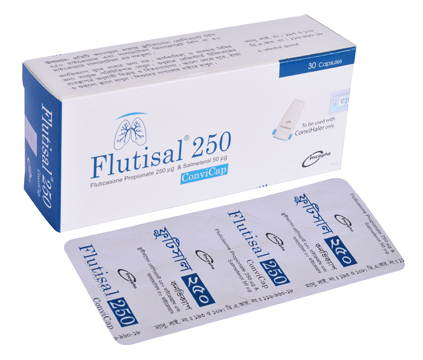 Flutisal 250 ConviCap: Each capsule contains Fluticasone Propionate BP 250 µg and Salmeterol Xinafoate BP equivalent to 50 µg Salmeterol inhalation powder. 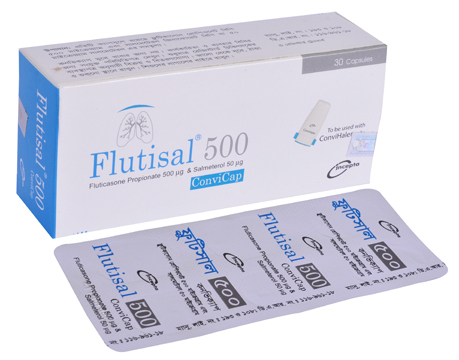 Flutisal 500 ConviCap: Each capsule contains Fluticasone Propionate BP 500 µg and Salmeterol Xinafoate BP equivalent to 50 µg Salmeterol inhalation powder. Fluticasone Propionate, a corticosteroid having the chemical name S-(fluoromethyl) 6α, 9- difluoro-11β,17-dihydroxy-16α-methyl-3-oxoandrosta-1,4-diene-17β-carbothioate,17- propionate. Fluticasone Propionate is a white powder with a molecular weight of 500.6 and the empirical formula is C25H31F3O5S. It is practically insoluble in water, freely soluble in dimethyl sulfoxide and dimethylformamide, and slightly soluble in methanol and 95% ethanol. Salmeterol Xinafoate, a β2-adrenergic bronchodilator. The chemical name of Salmeterol Xinafoate is 4-hydroxy-α1-[[[6-(4-phenylbutoxy)hexyl]amino]methyl]-1,3-benzenedimethanol,1-hydroxy-2 naphthalenecarboxylate. Treatment of asthma: Fluticasone Propionate & Salmeterol Xinafoate combination is indicated for the treatment of asthma in patients aged 4 years and older. It is indicated for patients not adequately controlled on a long-term asthma control medication, such as an inhaled corticosteroid or whose disease severity clearly warrants initiation of treatment with both an inhaled corticosteroid and LABA. Once asthma control is achieved and maintained, assess the patient at regular intervals and step down therapy if possible without loss of asthma control and maintain the patient on a long-term asthma control medication, such as an inhaled corticosteroid. It is not indicated for the relief of acute bronchospasm. Maintenance treatment of chronic obstructive pulmonary disease: Fluticasone Propionate & Salmeterol Xinafoate combination is indicated for the maintenance treatment of airflow obstruction and to reduce exacerbations in patients with chronic obstructive pulmonary disease, including chronic bronchitis and/or emphysema. Flutisal 100 ConviCap & Flutisal 250 ConviCap: 1 ConviCap twice daily (morning and evening, approximately 12 hours apart). 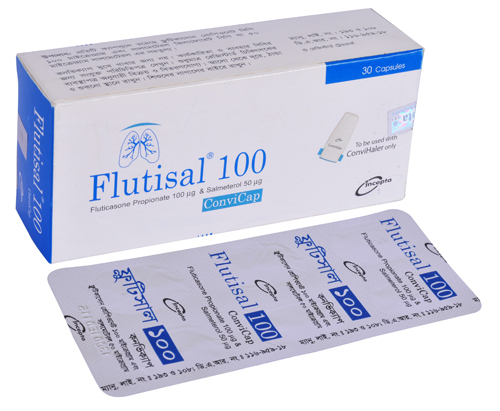 The recommended starting dosages for Flutisal 100 ConviCap & Flutisal 250 ConviCap for patients aged 12 years and older are based upon patients\\\\\\\' asthma severity. The maximum recommended dosage is Flutisal 500 ConviCap twice daily. For patients with asthma who are not controlled on an inhaled corticosteroid, the dosage is 1 Flutisal 100 ConviCap twice daily (morning and evening, approximately 12 hours apart). Flutisal 250 ConviCap: 1 convicap twice daily (morning and evening, approximately 12 hours apart). Rinsing the mouth after each inhalation is advised. The common side effects experienced are oral candidiasis, pneumonia, immunosuppression hypercorticism, adrenal suppression, growth retardation, glaucoma and cataracts etc. The few side effects have been reported infrequently like ear signs and symptoms; nasal signs and symptoms; nasal sinus disorders; keratitis and conjunctivitis; dental discomfort and pain; gastrointestinal signs and symptoms; oral ulcerations; oral discomfort and pain; lower respiratory signs and symptoms; muscle stiffness, tightness, and rigidity; bone and cartilage disorders; sleep disorders; compressed nerve syndromes; chest symptoms; fluid retention; unusual taste; viral skin infections; disorders of sweat and sebum. 1) Fluticasone Propionate & Salmeterol Xinafoate combination should not be initiated in patients during rapidly deteriorating or potentially life-threatening episodes of asthma or chronic obstructive pulmonary disease. 2) Fluticasone Propionate & Salmeterol Xinafoate combination should not be used for the relief of acute bronchospasm. 3) Inhaled corticosteroids should be used with caution, if at all, in patients with active or quiescent tuberculosis infections of the respiratory tract; untreated systemic fungal, bacterial, viral, or parasitic infections; or ocular herpes simplex. Pregnancy category C. It should be used during pregnancy only if the potential benefit justifies the potential risk to the fetus. Administration of Fluticasone Propionate & Salmeterol Xinafoate combination to women who are breastfeeding should only be considered if the expected benefit to the mother is greater than any possible risk to the child.